As we arrive, we can barely contain our excitement. We smile as we open the car door, step out onto the pavement, and set out toward the crystal blue water that awaits us. It’s hot. Even for Florida in July. We set our things down on the picnic table, checking to make sure our sandwiches are safely tucked inside our bag so the vultures patrolling the area don’t get to them. Sweat dripping down the backs of our necks, we are imagining how nice the water will feel. The cold, 72 degree water still gives me goosebumps as we jump in. We’ve been exploring the Florida springs every week since we started dating a year back, yet the water always feels so much colder than I imagine it to just before jumping in. 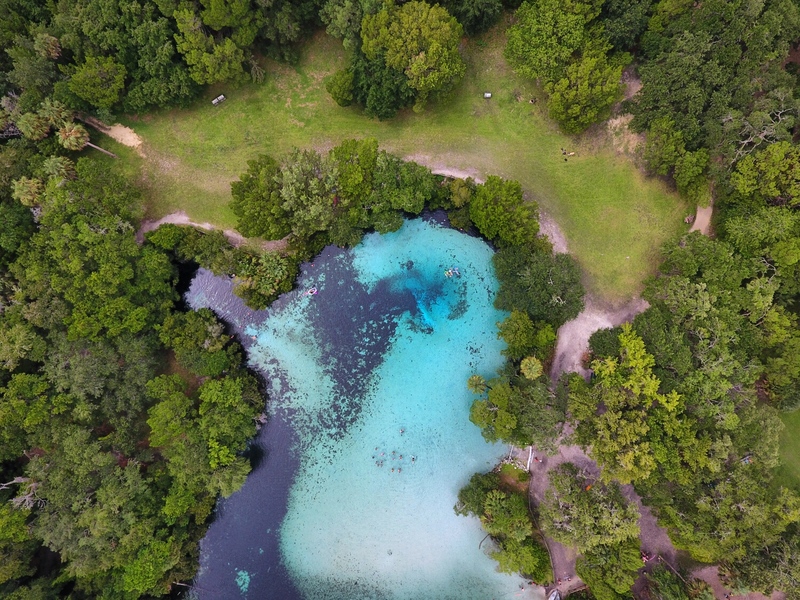 Located on the St. John’s River within the Ocala National Forest, Silver Glen Springs is a popular site for snorkeling and canoeing. This first magnitude spring emits 65 million gallons of water per day! In winter months, you can find manatees here seeking the warmer spring water that remains a steady 72 degrees year round. Centrally located in the Ocala National Forest, Silver Glen Springs lies about an hour and 10 minutes from Gainesville, an hour and 15 minutes north of Orlando, and an hour and 15 minutes southwest of St. Augustine. You’ll find it on FL-19, right across the street from The Yearling Trail. Entrance Fee? Yes, $5.50 per person. Hiking? Yes. There are multiple hiking trails located within the Silver Glen Springs Recreation area, including Spring Boils Trail, which leads to Jody’s Spring, mentioned in Marjorie Kinnan Rawlings novel The Yearling. Speaking of which, The Yearling Trail that inspired the author’s Pulitzer Prize-winning book is located across the street from the Silver Glen Springs Recreation site. The trail leads to Pat’s Island, and consists of a 5.5 mile outer loop and 3.5 mile inner loop. Camping? No. Although there is no onsite camping at Silver Glen Springs, there are plenty of sites within the Ocala National Forest to pitch your tent at, such as the Hopkins Prairie and Juniper Prairie campsites. Scuba diving? No. Scuba diving is not permitted at Silver Glen Springs. The only dive site within the Ocala National Forest is located at Alexander Springs. Snorkeling? Yes. Although there is no scuba diving at Silver Glen, you can bring your snorkel mask and dive on in to see what lies below the surface at this great blue spring. Kayaking/Canoeing? Yes. Silver Glen rents canoes (not kayaks) for the following prices: $16 for 2 hours, $24 for 4 hours, and $38 for the entire day. There is a $20 deposit for all rentals. If you bring your own kayak/canoe, there is no launch fee! The Silver Glen Run is about a half a mile and leads into Lake George. Fishing? Yes, but not in the spring. You can fish on the Silver Glen Run and Lake George as long as you have a valid fishing license, which can be purchased here. Pat throwing rocks near the spring hole of Silver Glen Springs. Tip: As with all of the Florida springs, you’ll want to arrive early in the morning, especially during summer months and on weekends and holidays, as the spring can get very crowded. Have you ever been to a spring before? Was it a hot spring or cold spring? Share you experience in the comments section below!